Have you heard of Lo & Sons? They make the best travel bags (and camera bags, laptop bags, and other convenient carrying satchels) and offered a giveaway on The Everygirl a couple weeks ago. Lucky you gets another chance at winning one here on Live Creating Yourself! The folks at L&S are offering one reader a bag of their choosing - either the slightly larger OG or the medium-sized OMG. The bags are lined to safely transport laptops and there's a separate compartment to store shoes (heels, sneakers, slippers, whatever the case me be). Valued at almost $300, this is quite the opportunity! 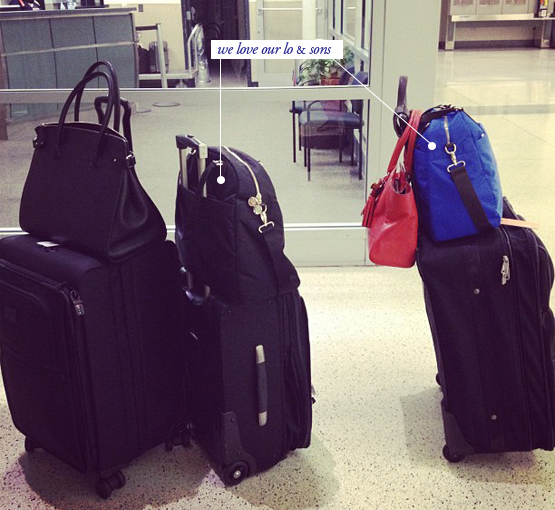 Easiest guessing game of all time: which stack of luggage is mine and which is Danielle's? Like Lo & Sons on Facebook and leave a comment here letting me know which style (the OG or the OMG) and color you'd want if you are the winner! Monday, September 25th at 11:59pm - winner will be announced the next day! GIVEAWAY CLOSED! WINNER HAS BEEN EMAILED AND WILL BE RECEIVING HER BLACK OG VERY SOON! THANK YOU TO EVERYONE WHO PARTICIPATED! I think I would have to go with the OG in red....ah its so pretty! I'd go for the O.G. in army green--perfect for fall! I like the OG in army green! Great giveaway! i'd loooove to win the OMG in raspberry!! I like OG in black! Totally would pick the OG in Royal Blue! Fab giveaway, fingers crossed! Love the royal blue OMG!!! Just beautiful!! 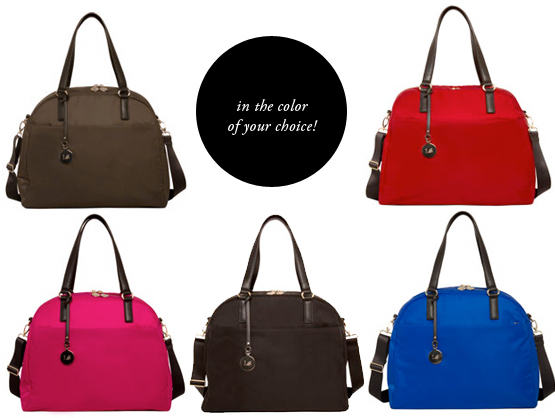 What a great bag - Love, love, love the OMG in raspberry! So hard to choose, but I'd love the OG in black...the lavender interior is amazing! (The OMG in raspberry is a close second.) Thanks for this fun giveaway! I'm dying for the OG in black. Classic and perfect! I adore the OG in black! I love love love the OG in black! Mmmm, I am definitely feeling the bright blue OMG. So beautiful and perfect. Would love the OMG in black! I love the Blue soooo pretty! AH! I love Lo and Sons. I'd love the OG in pink; it's so adorable! I love the OMG in Royal Blue. What a beautiful bag! Would love the OMG in black! So classic and perfect for work, gym and travel! These bags look awesome for traveling or even just hauling a ton of stuff to and from the office like a pack mule. I love the O.G. bag in royal blue - very pretty! I would get the OG in raspberry! Everygirl needs a splash of color in her life!! Loving these bags! I would love to win the OMG in magenta!! the OG in army green just nails it! love!! The OG in black, no questions asked. Perfect match with my red luggage. So many great products to choose from. The stunning royal blue OMG has got it going on too. Is your luggage the set on the right? The OMG in royal blue! LOVE IT! It would be perfect for my dance gear. Love the OMG in Raspberry! I have been looking for the perfect overnight bag, and this is it! I would go for the OG in black. It's so hard to choose but I think I'd go with the OG in army green! Love the OMG in Royal Blue!! I would love love love the black O.G. bag with gold hardware. Please! these bags are gorgeous! i would have to choose the Black OG bag! I would love to have the O.M.G. in espresso exterior and camel interior! OG in black for sure!! So cute! i LOVE the OG and the blue is gorgeous! seems like the perfect gym and overnight bag! The OMG in Crimson Red, definitely!! What gorgeous bags! I would choose the OG in black. So classic! The OG in Royal Blue! I've wanted it since I first found out about them. The OMG in Royal Blue, definitely! I'd love the OMG in espresso. Gorgeous!! the OMG in black! gorj. Ooh the Red OG. Beautiful! the OMG in royal blue!!!! I think I'd go with the OG, but I can't decide if I want red or black! The OG in black. I DIE! So great. I totally love the OMG in black. I can think of so many ways I would use this bag! OMG in the olive green color. It would save my current disheveled work/gym bag appearance! I think I'd choose the OG in espresso. Hard choice!!! Love them both. Thanks for the giveaway. I think, the OG in red! Love them both but I'd go OMG in black! I like them on FB as Alaine Elise. I would love the OG in espresso! I like the OG army green! I want the OMG in raspberry!! So excited about this giveaway! Love the OG in black! So chic! The OG in Black for sure! OG in green is gorgeous! I have been dying for one of these bags! Fingers crossed!! i'd like the OMG in bright blue! The perfect pop of color for any work outfit. My favorite is definitely the OMG in Royal Blue. It would be the perfect size for work! I love the OG in black. Such a classic bag. I love the OG In fuchsia! Love these bags! I think I would go for the OMG in raspberry (...or black)- oh the decisions! I would love the OMG in that beautiful blue! I would love to have the OMG in black. I'm a consultant so I travel Mon-Thursday every week. I would love to look so much more stylish running through the airport than I do right now with my computer backpack! Great giveaway! 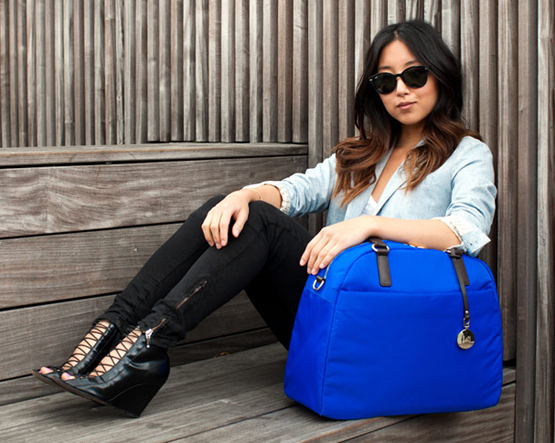 I love the OMG in blue, its the perfect gym bag! I would love the OG in Royal Blue - what a fabulous giveaway! Love the O.G. in camel!! Goes with everything!! I'd love the OG in black! So cute! Love this bag. I would get the OMG in Raspberry! i do believe i would get the OG in black, to match my OMG in black. i love it - it's the perfect daily gym bag and quick trip bag! Definitely the OG in raspberry! I've been wanting one for forever. Maybe I'll bite the bullet before Alt if I don't win one. Been obsessing over these bags since I first saw them on The Everygirl! Would love the OG in espresso..what a great travel/gym bag! I would LOVE the OG in black-- such an amazing bag!! I love the OG in raspberry. Love the OMG in raspberry. :) So cute! I like Lo & Sons on FB..Kenya G.
I would loooove the OG in hunter green! These bags make me swoon. And who doesn't need another carry-all, am I right? I think I'll go with the OG in black. But the red is fab too. Ah, what the hey. Let's go with Royal Blue as my final answer. I liked Lo and Sons on facebook! I love the OMG in black. Great giveaway! I've been coveting the OMG in army green for so long! Great giveaway! These bags look so smart! I'm a big day-tripper and they look like they're big enough to probably work for an overnight too! I would love the OG in that pretty bright blue! I would really love the OG in that gorgeous raspberry pink color, but it isn't listed on the website at the moment...boo. I guess second choice would be black? that lavender interior has won me over. OMG in black is what I would choose! What a great giveaway! I love the OG in the royal blue! I love the OMG bag in raspberry! thanks for the opportunity! I choose the OMG in royal blue! YES! i bought the omg bag after seeing it on the everygirl, and have been carrying it as a work bag! i'd love to get the og in expresso to use as a carry on! OG! Probably in black. My luggage is powder blue, so maybe pink would work, too. OMG. Blue. Love your blog!! Love the OG in Raspberry! Awesome giveaway. The OMG in Royal Blue is fantastic! I love the OMG in espresso - classic and perfect for weekend trips! OG in army green. What a great looking bag!! I love the OG in black! What a fabulous giveaway! This would be perfect for my honeymoon in a few weeks! I think I would have to chose the OG in black. The OG in blue! Ahhh what a fantastic giveaway! I love all there bags!! I would choose the OMG in Raspberry so cute!! I love the OMG in raspberry! Ugh I'm dying for one of these! I would get the OG in Black, although I love the cobalt too! Love the O.G in Army Green! The OG in blue ! Thank you for this giveaway ! The O.G. in blue is perfection! The OG in black pretty please and thank you! I would love the OG in black - What an awesome travel bag! my favorite is the OG in black! I love the OMG...in pink of course! The OMG is perfect in pink! I just love the O.M.G. in Raspberry! OG in army green would be perfect for overnight work travel!!! Definitely the O.G. in Black. It's amazing! And what girl can't use a new travel bag? Love the OG in Brown for fall! I love this bag, and would have to pick the OG in black. Such a perfect travel bag! Also, I can't wait to see a full tour of your apartment! The new place is looking fab! I love the O.G in Espresso! I travel a lot and i can see myself falling head over heels for this! I also have liked them on Facebook. I love these bags! The OMG in blue pretty please! I would just die to have royal blue OMG!!! Just beautiful!! THE OG Black is fabulous too. Would be thrilled to win either! I entered on The Everygirl a while back (didn't win), then I entered on Danielle's page when she had the giveaway (didn't win)... SO MAYBE I'll get LUCKY and win YOURS! I'd totally love the OMG in army green... perfect for a quick sleepover or gym clothes! Love it!! in LOVE with these bags! dreaming of an OMG in black! xoxo jillian ps already liked lo&sons on facebook! I LOVE the OMG in Amry Green or Bright Red. They both are perfect so it is hard to choose. If I win I would love for you to decide! The OG in Espresso would be perfect! Such a tough choice but I'd love The O.M.G. in black! i love the OG but i think i would need the OMG with the way i roll. the espresso color is perfect. I am SO loving this bag! I travel so much and think it would be perfection - I would go with the OMG in blue! Loving the OMG in Army Green! The OMG in Espresso is gorgeous!!! Love it! THE OMG in black! Classic and goes with everything. The OG in black. I love the lavender interior too. I liked Lo & Sons on Facebook. Thanks for the chance to win! I love the OG in army green! OMG, I love the OMG! I would like to take my travel bags http://goo.gl/p5mxE to attend sorts of outdoor activities or go travelling. The OG in that lovely blue color... So gorgeous! I like Lo & Sons on FB. I like the OG in black! The OG in raspberry is gorgeous! love the OMG in black (really love the mixed grey/black in the photo but dont see it available to order). Also just got my affordable and adorable glasses from mezzmer. thanks for the recommendation, they are awesome! I have been dying for one of these-it would be so perfect as a working girl in NYC but it has been out of my budget for months. I'm a fan of the OMG in that rich, royal blue! I would do the OG in Army Green. So great for long weekend trips! I already 'like' Lo&Sons on facebook. The OG in green! What a marvelous bag. Seriously. The OMG in army green! the og in black - BIG AND CLASSY. the O.G. in royal blue! Omg in red!!!! I am on a plane right now and need a new carry on!!! I would love an OMG in raspberry for a trip I'm taking in October; it would be just perfect!! I like the royal blue, though the raspberry is a very close second. Both are great colors! Hope I win! :) and thank you. I would love the bright red one! It would be so cute for traveling! The OG in Espresso would be my choice, it would be perfect to take on my fall weekend getaway picking apples, drinking hot cider and taking in all the colors of fall!! Such a tough choice but I think the OMG in red....ahh, loving this!! The OG in black is gorgeous! Such a great giveaway!! OMG in royal blue is on my radar for quite a while... Thank you! I love the OG in Black. I've been looking at these bags for over a year now. Lol thanks for the contest!!! The OG in red! Love how you can hook these on your suitcase. And the little shoe compartment? So smart! The OG in army green, please! the og in black is so classic & lovely. love your blog. thank you for it all. The OG in black...it's perfect. I would love to have the O.M.G. in Espresso & am so excited to have learned about this brand! What classic, functional bags! I would love the O.G. in Espresso. So beautiful. Thanks for the giveaway!! The OG In Espresso is so pretty! Great giveaway, Alaina! Definitely the OG in BLUE is B-E-A-U-TIFUL!!! Love these bags!!!!! Thanks for introducing them! The OG in blue, pretty! I love the OG in blue!! Likes Lo & Sons awhile ago! Love the OMG in Army Green! Has the winner been announced?! Yes, when and where was the winner announced please?